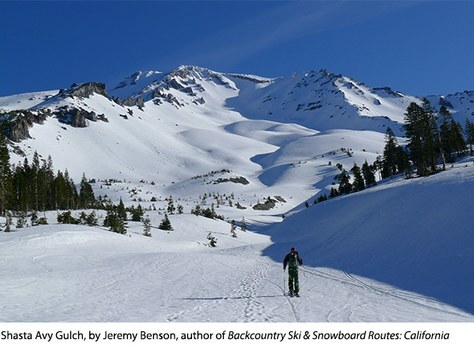 The authors of Mountaineers Books' "Backcountry Ski & Snowboard Routes" series offer favorite tours from their respective guidebooks for California, Colorado, Oregon, Utah, and Washington. 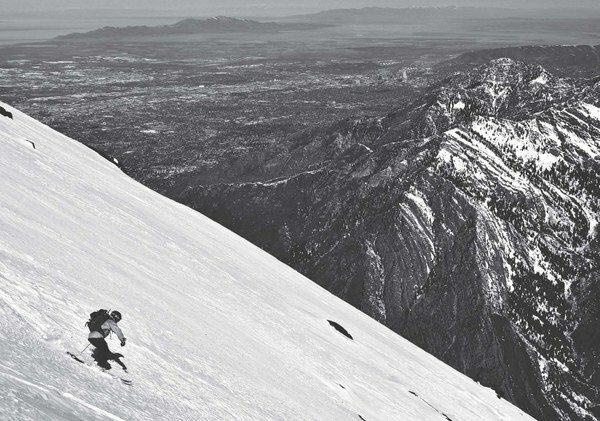 In the peak of ski season, we asked the authors of our Backcountry Ski & Snowboard Routes guidebooks to spill the beans on their favorite routes. Following are their faves – out of the 100 or so tours in each of their books. Below is the beta and general route description as excerpted from each book. You’ve got to get up really early to beat the dawn patrollers to the northeast side of Jakes Peak on a powder day. The same handful of people put in this skin track virtually every time it snows. If you don’t like to hike in the dark, don’t worry: you’re guaranteed to have a track put in by the time you get there. 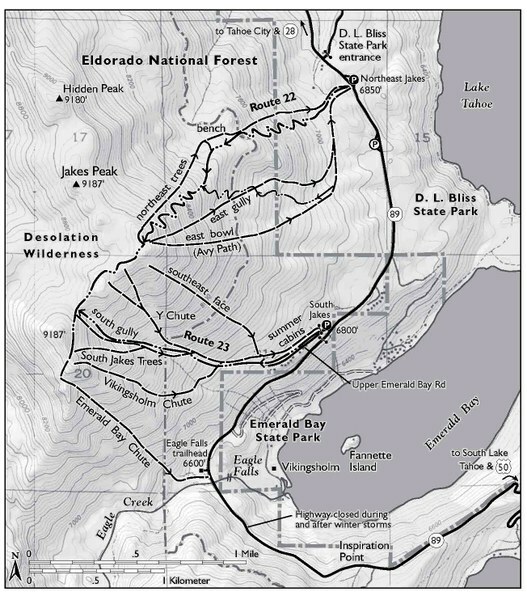 The steep trees and open gullies that flank the northeast and east sides of Jakes Peak make this zone one of the most popular among backcountry skiers in the entire Lake Tahoe Basin. Named in honor of Jeffery James (Jake) Smith, a ski patroller who died in an avalanche at Alpine Meadows ski area in 1982, Jakes Peak is a Tahoe classic. Perched above D. L. Bliss State Park on Emerald Bay on Tahoe’s west shore and just inside the Desolation Wilderness, Jakes is also among the more beautiful places to ski in the world—not to be missed. Brittany: “The Dead Squirrel is one of our most favorite routes for a few different reasons. First, the couloir is about aesthetic as they come. We noticed it years before from afar while skiing another peak in the area and it instantly got added to our list of places we needed to ski. 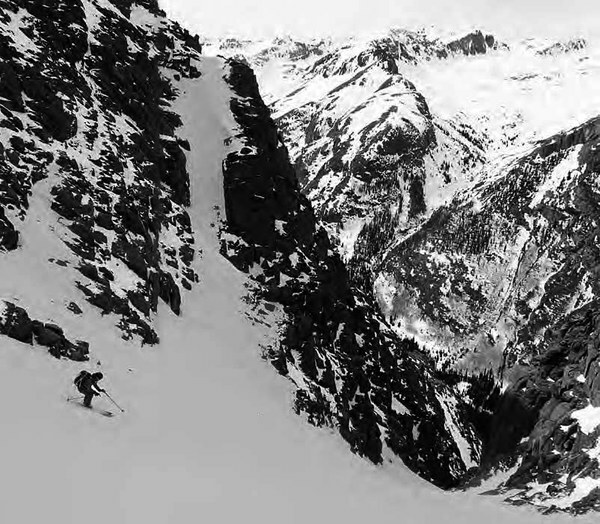 Though it looks incredibly narrow from far away, the couloir is indeed plenty wide enough to ski and is not intimidatingly steep, consistently in the upper end of the 30-degree range. Second, naming it was fun. When we skied this line, there was no known name for the couloir. Some friends of ours had skied it a year before us and told us that they were joined on their descent by a frozen squirrel which proceeded to somersault down the mountain with them as they continued to ski. Hence, the name Dead Squirrel." The Lake City zone of the San Juans may not get a lot of snow or a lot of press, but the hidden couloirs in this area are some of the best you can find. Nearly 3000 feet from top to bottom, the Dead Squirrel Couloir is an absolute gem in a remote setting. Photo: This skier has a long, long way to go to reach the bottom of the Dead Squirrel Couloir. 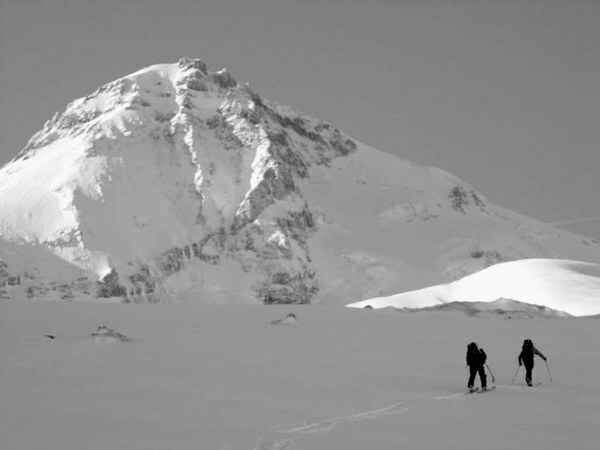 The Mount Hood Circumnavigation is an expert ski mountaineering objective. 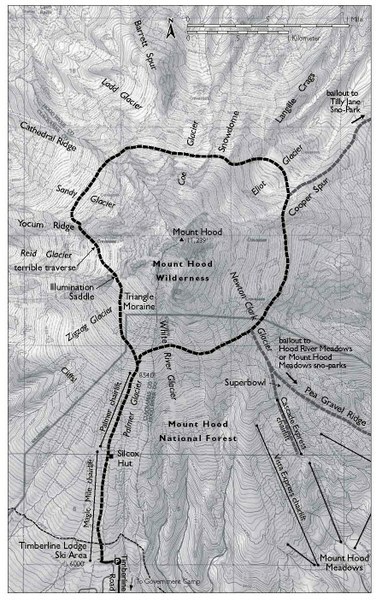 The 12-mile trip, which gains 6000 to 8000 feet, is for expert mountaineers only. Although not completed by this author, it’s worth mentioning as an excellent way to get to know the mountain and, sooner or later, a route the ski mountaineers either complete or at least have on their tick list. More burly and dangerous than the South Side summit routes (see Routes 6 and 7), this takes more planning, preparation, and guidance than listed here. 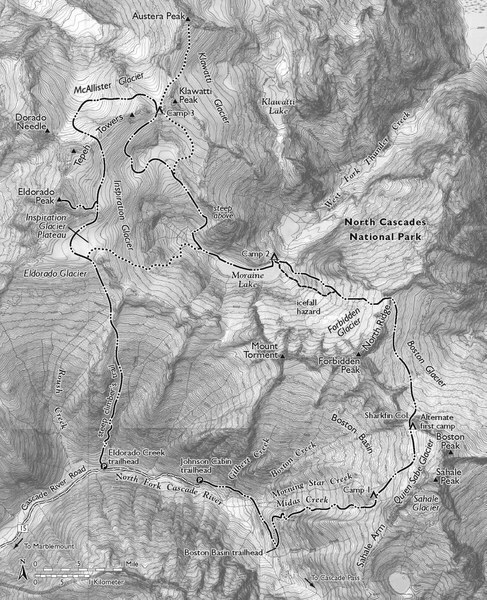 There are several starting points, but a round trip from Timberline Lodge is the most common. Most skiers head clockwise and stick between the 6000- and 9000-foot elevations. Jared: “Bonkers - When conditions align perfectly, the powder is soft, and the snowpack is stable, you would be hard-pressed to find a more fun descent than Bonkers in Big Cottonwood Canyon. I love this route because Bonkers is 2,000 vertical feet of perfect fall-line on a wide-open ramp." 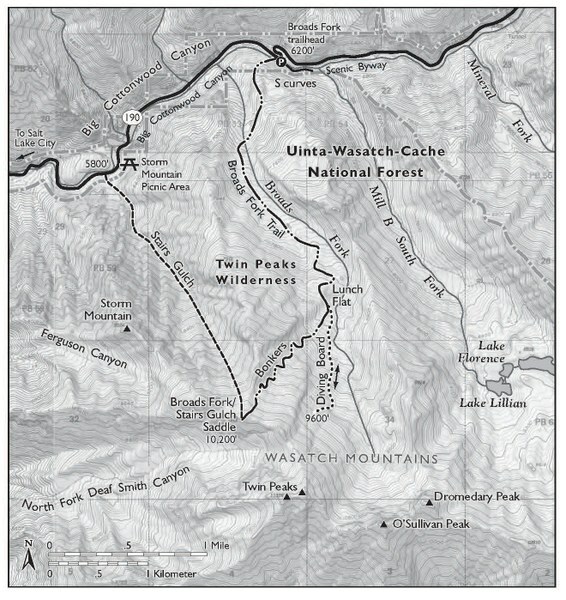 Bonkers, a massive ski line in upper Broads Fork, absolutely belongs on the list of classic descents in the Wasatch. A steep 4000-foot climb in four miles gets you to the top, where you’ll be rewarded with a nearly 2000-foot descent on a wide-open, northeast-facing ramp. The run is so long you can feasibly make a hundred turns from top to bottom. Just try to ski this thigh-burner without stopping. The saddle atop Bonkers also allows easy access into the expert-only Stairs Gulch, an enormous, glacier-carved gully that drops 5000 feet to the highway below. Both runs are pretty much snow-covered rock slabs, making for unusual avalanche danger (think glide cracks). Ski here only when the snowpack is highly stable. Photo: Salt Lake City buzzes in the valley far below the upper slopes of Broads Fork. Martin: “For me, that favorite would be the Forbidden Tour. The Forbidden Tour epitomizes the savage nature of ski mountaineering in the North Cascades and is surprisingly accessible for how remote it is." Permits A free backcountry permit is required to stay overnight in North Cascades National Park and can be obtained at the Wilderness Information Center in Marblemount. A parking pass is not required anywhere along the Cascade River Road. 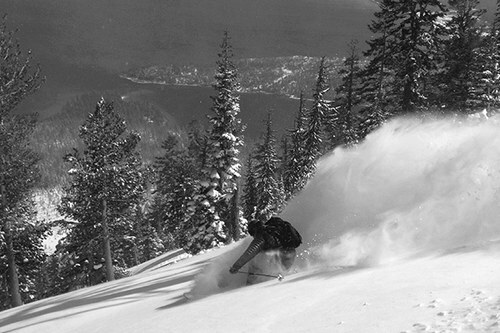 The Forbidden Tour epitomizes what makes the North Cascades a great skiing range. 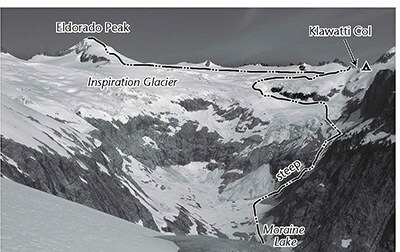 This tour crosses seven glaciers of substantial size and drops deep into Washington wilderness. You will find yourself touring, skiing, and camping in some of the most alpine environs of the Lower 48 on what is essentially a circumnavigation of Forbidden Peak. The tour’s commitment level increases substantially once you drop onto the Boston Glacier. All things considered, the Forbidden Tour is a real ski mountaineering adventure that requires skill and commitment. by Frank Konsella and Brittany Konsella. by Martin Volken. 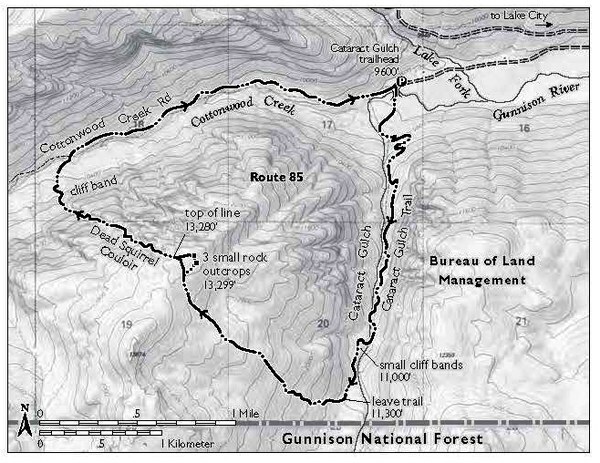 Contributions by Guides Of Pro Guiding Service.